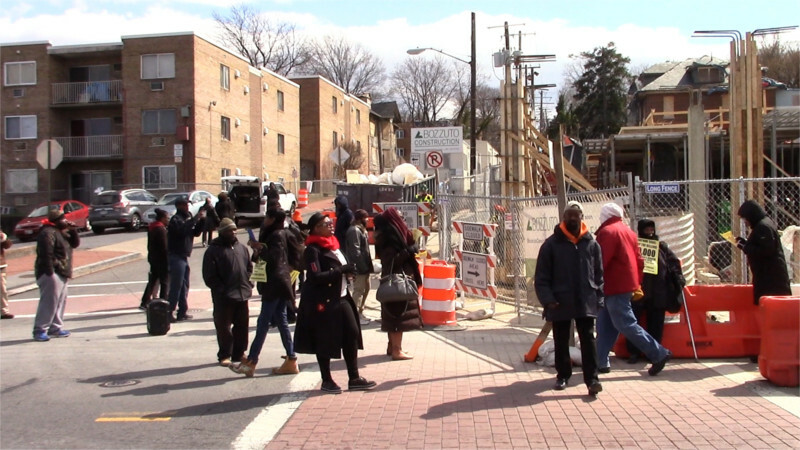 On the 9th of March, protesters called to the scene by DC Councilmember Trayon White shut down Bozzuto's Maple View Flats construction site in Anacostia for the second day in a row. One of the anchors of the project is a Starbucks, whose products are not affordable for current Anacostia residents. The protest is because Bozzuto is refusing to hire local residents to work on the project and because gentrification projects are not welcome in Anacostia. A flier distributed for the March 8 and 9 protests listed these demands: Jobs for DC Residents, Stop depopulation and gentrification, stop unfair development, citywide moratorium on all development. The first protest on March 8 arrived at noon, and a cement mixer truck was soon unable to leave the site to pick up its next load due to protesters. Work stopped and workers were sent home at 1:30PM. On March 9, protesters again arrived on-site at noon, and this time it took only an hour for Boszzuto to pack it in and send his workers home. 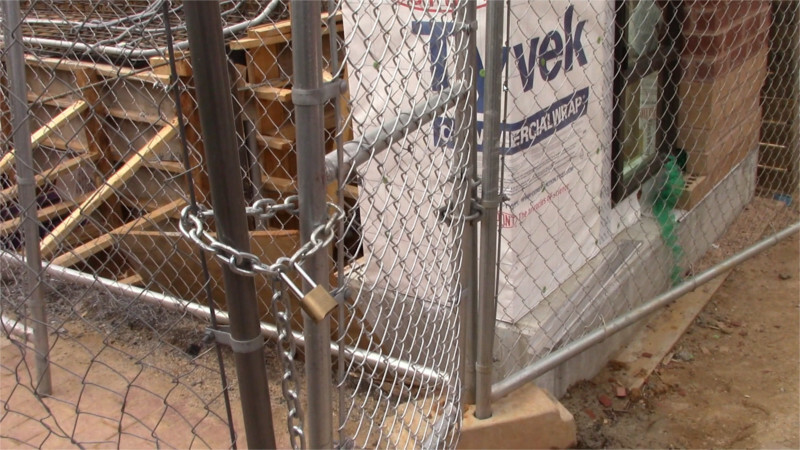 Bozzuto's stubborn refusal to hire local residents has now cost the project two whole afternoons of work, and declared it a target in the entire community. 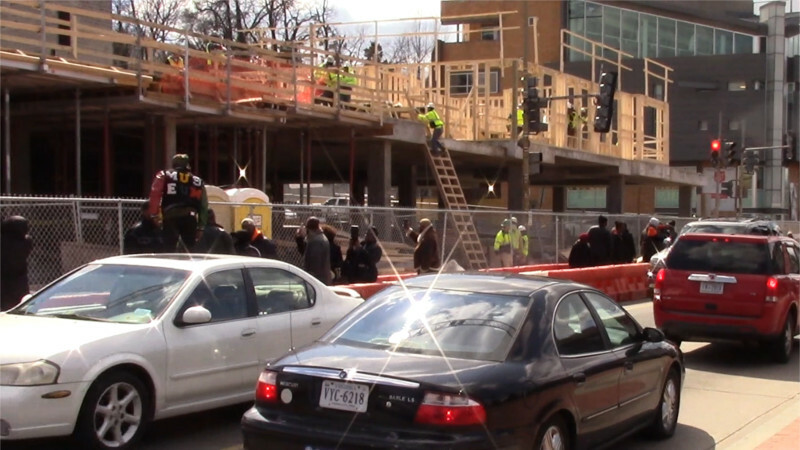 Bozzuto claims to have hired "25 DC residents" but protesters saw only three African-American workers on the entire site on March 9. This was three more than were seen on March 8. He will have to do better if he wants the project to move forward, as protesters say they will be back again and again. These repeated shutdowns are enough to bring construction to a sustained halt. As for Starbucks, it is clear that the Starbucks would be intended to serve "New Washingtonians" whom developers expect to be moving into Anacostia if they can get projects like Maple View Flats finished. The African-Americans who live there now cannot afford $5 cups of coffee. Thus, Starbucks has been singled out as an unwelcome part of this project.